A Chinese company wants to build this incredible four-square-mile floating underwater city using the same techniques they're using for the construction of the 31-mile bridge that links Hong Kong, Macau and Zhuhai. It's incredible—the kind of stuff I dreamed about when I was a little kid. 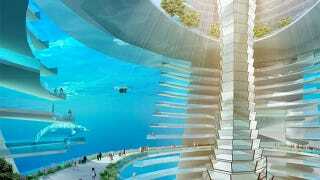 The China Communications construction company commissioned AT Design Office to plan the ocean metropolis. They are now in talks with a large Chinese investor group to decide whether to pursue the project or not. Part of that bridge is an underwater tunnel, which is joined by a 150-metre-long precast concrete box. The mega box is cast on a nearby island and floated to site before being connected. We were appointed to work with the engineer to come up with a masterplan for a 10-square-kilometre floating island that can be built with the same technology. One of the coolest things about this project is that it has underwater and above water levels.